A few steps into how writing is taught in my classroom…. I usually teacher upper KS2 – but I have taught all KS1 and KS2 – and adhere to these ideas. At my school the pupils have targets – written marking by the teacher is minimal but feedback is expected in class with children acting on it as we go. Peer marking and self evaluation is also trained in to the children, using Even Better If and What Went Well. Obviously at Key Stage 1 this process needs to be modelled by the adult. I rarely teach writing as a standalone. It is part of a purpose, linked to work we’ve done, a book we’re reading or an experiment we are doing. In short, every bit of writing we do in the classroom has a context, and a purpose, and is a learning opportunity. Grammar rules, spelling support and punctuation is also taught standalone, across the whole school, for 20mins a day. But writing sessions need to pull this learning in. Individuals have their focus for their own writing, but we may have a class focus for new grammar or spelling rules as well. Displays make use of this – as well as key examples during reading. I encourage planning – but by the end of Key Stage 2 I don’t really care how they do it. We model different ways of planning – e.g. Story board (pictures), story mountain or just good old fashioned boxes, but, to be honest I don’t care as long as they have an idea where it will end. Instead I will limit something via the task. For example when we were writing a biography we limited ourselves to the same template and to two or three choices (from topic work). No time wasted on ‘researching’ their favourite footballer. When we looked at diary entries we all did the same piece based on August from ‘Wonder’ – then we all knew where we started and where we were finishing. I rarely ask them to just ‘write’ – though I will sometimes give them a choice of the character to write a diary entry from. When teaching I rarely give success criteria up front, instead as we get started I will give them something linked to the genre (or context) and remind them of any grammar focus, especially if new. However I always stop them say, fifteen minutes in, and ask them to think any criteria the want to work on. They make a note of this at the bottom of their page. Note that for children who may find this difficult this will be modelled a part of a group, and if need be give a group success criteria. I’m a huge believer that the children cannot write it if they haven’t read it. Often as we write I will also write the task and stop and share. Often I will do this on the whiteboard as a ‘guided write’ to get thing started. Then I will pause the board, get them going and continue myself. When we stop in ten minutes or so to look at success criteria I will share mine, and they will share theirs. This works very well for younger children who can use my modelling as springboard. I also love working from poems and books. Sharing good writing, and not so good writing. Asking them to reflect on stories by writing diaries, school reports, letters etc. We have been reading this book – and the children had found some of the ideas and concepts quite challenging. As such we spent some time focusing on vocabulary and themes – exploring the choices made by adults and how they could appear to children. To do this we did some ‘short writing’ snippets of conversations that the characters had with one another (focus on speech punctuation, and on formality) in the lessons before. Some of which were on our wall to remind us. We then built up to a write where we chose Liev (a kind of bad guy) and wrote two letters. One to a ‘higher up’ – e.g. An old army boss or his current chief and another letter to a friend. Both letters had to explain his motives and we discussed which letter would be more honest. With this activity the letter writing layout was reinforced, but also the diferrent language and grammatical feature a more formal letter would have. A whole assortment of Pirate works went into this – including the reading of various picture books and previous work on the characters. Then we decided to write a postcard to a pirate. Simple really. We thought about what a postcard is, discussed language we would use and then wrote it in our books first. I modelled mine, and then those less confident continued from where I left off. 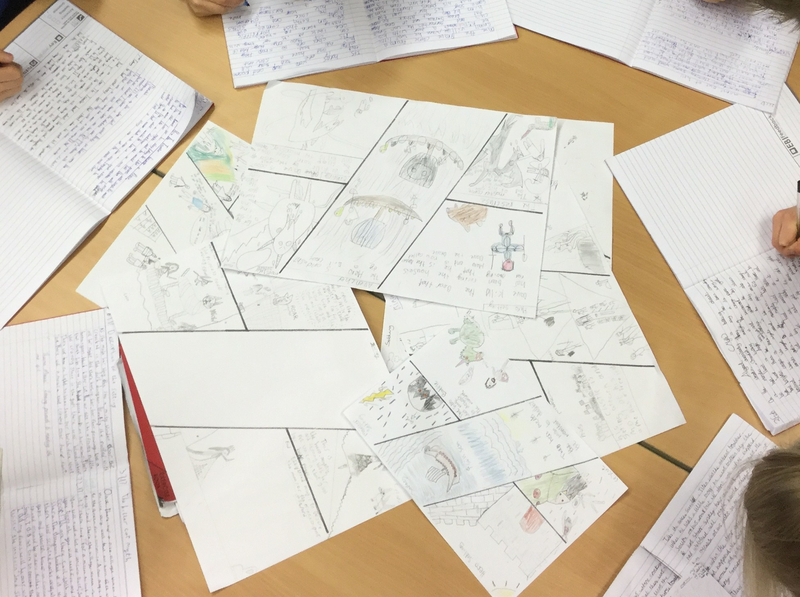 A taught editing session (with year two the same principle applied we read our work and looked for finger spaces, capital letters, and any words that didn’t seem right) – then the copied it up. Key points – to finish with! 1. Context is everything – especially with the more tricky vocabulary. Make your literacy lessons worthwhile. Don’t waste time – if you want them to write biographies link it with their topic, scientific writing can be done in literacy etc. If you want pictures of a character do that in art. 2. Expectations need to be high. You know your children – so high but not unobtainable; if you want them to spot missing capital letters then you need to pull them up on it. I had a chart once (only needed it for a week) where every missed capital letter was a minute they owed me. Y6. It worked. Word walls and misspelled words regularly shared. 3. Work ethic – a school wide issue I know – but they need to get used to focusing on their work. They need to produce a minimum. I don’t always stop ten minutes in, but when I do I use it to reinforce not just the grammar and punctuation expectations but how much I expect to get done. 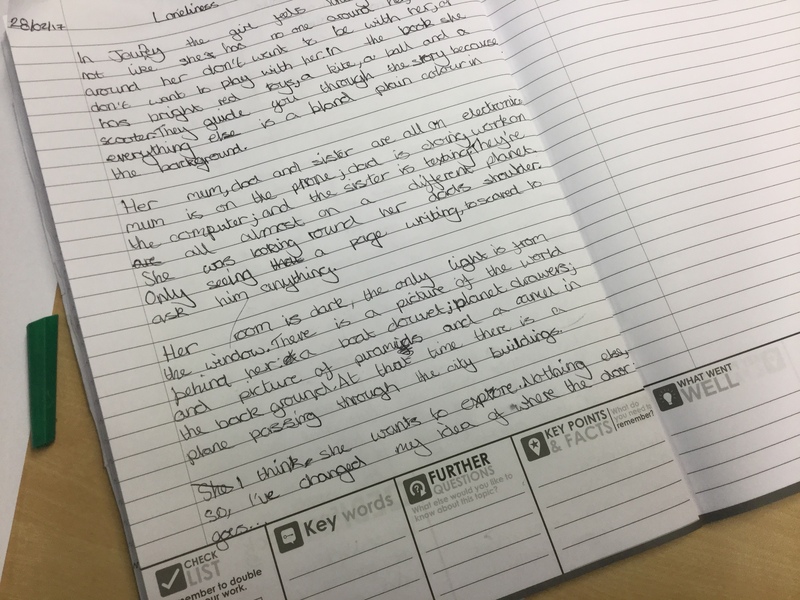 I give them a specific five mins where they can look at someone else’s work and get ideas – they edit and correct in a different colour so I can see how they apply their learning and we use books with space at the bottom for comments. Silence is the norm when they actually write. 5.Editing is an important skill and needs to be taught and modelled. Edit your work to show them them the process and, with younger children, give them an aim to editing. E.g. Just sentences, or just capital letters. You want them, by the end of Y5 to be drafting and then editing a piece – google docs is brilliant for this is you can model as they type! Posted by RS on August 20, 2017 in Curriculum.